The finals were a very close matchup between the Red Wolf Squadron and the Coal Train but in a universe point victory the Wolf was barely able to squeak past the Train 10-9. Everyone all week played really hard and learned a lot. I was very impressed with the amount of effort the campers showed both on and off the field. I have just finished uploading the photos taken both yesterday and today (semis, finals and award ceremony) which will take quite a while to go through so here they are. Yesterday morning each team went over the style of zone that they wanted to play for the upcoming tournament. After lunch the distance contest was held in three divisions (boys 15 and under, boys 16 and over and girls) as part of the Disc Olympics. The second event of Disc Olympics, MTA (maximum time aloft) also occurred as mixed pairs took the field in hopes of gaining the longest time. 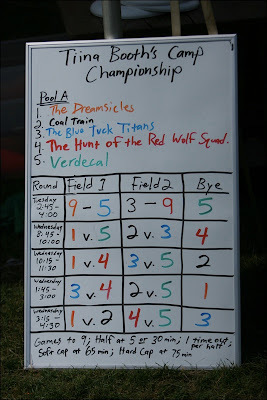 In addition, the Session B tournament commenced and one round was played yesterday. Once the cleats were hung up for the day and the players were well fed, trade night took place where players traded gear from their home teams and around the world that they had acquired. Breakmark even stopped by with some new threads for sale as well. Time for me to catch all the action of the next four rounds of the tournament so more media soon (Thursday afternoon), so check back in for more fun. It is another nice more in the valley, the weather is cool and there are plenty of cloud coverage to protect us all from getting sunburns. Last night was the weekly camper vs. counselor game where the counselors took a very quick lead and kept on leading. The campers put up a great fight but in the end the counselors added another win to their records with a 21-1 victory. The campers did however beat the counselors to the make-your-own sundae line and consumed some fantastic ice cream from Bart's. 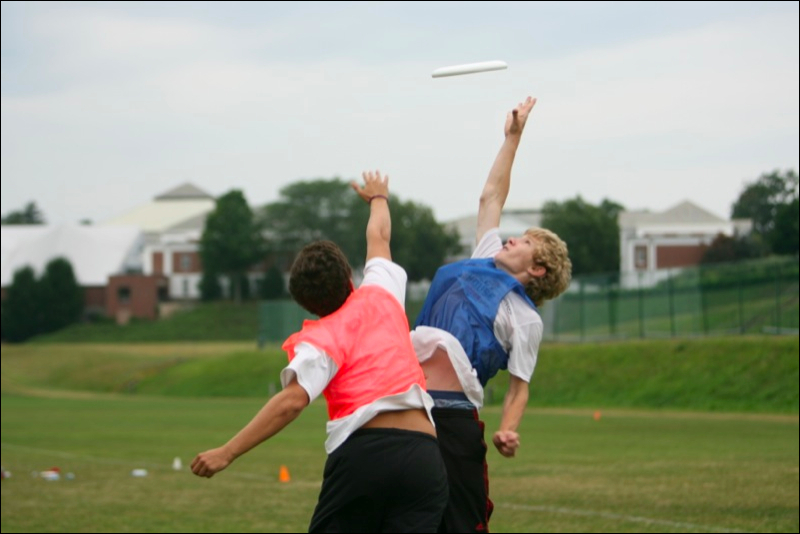 This afternoon we will have Trade Night, the Disc Olympics and the first round of the NUTC tournament but more about all those in tomorrow's post. Until then, here is all the media from yesterday along with today's newsletter. NUTC Session B - Welcome! This morning and most mornings from now on, I will bringing you some footage of the previous day along with a very brief synopsis. Today I have for you some great photos taken yesterday and newsletters from yesterday along with today. Last night, the players found out what team they will be on for the rest of the week and afterwards competed in games to choose their team colors. The scrimmages looked great yesterday and everyone is well rested for today's action and hopefully for the camper vs. counselor game this evening. Without further ado here is the first batch of media from Session B. Today was a day of variety. This morning we held a distance contest followed by seminars on various topics led by the counselors (including guest counselor BVH) and Tiina. This afternoon saw a lot of scrimmage action as the campers took on a group of high school outsiders. The outsiders won the first game to 7 but the gold campers were able to go on a nice run in the second game to 7 and win 7-5. This evenings event was the traditional tuesday trade night where lots of bartering and purchasing took place. Even some of the counselors were able to pick up some sweet gear from around the world. Check out the photos from today, right here. Tonight we had the NUTC Gold Camper vs. Counselor Game where the counselors prevailed over the campers 26-3. Not too shabby for the campers, they put up a good fight and the game was closer than the score. They are definitely well on their way to go from good to great players! After the game we all went back to the dorms for make-your-own-sundae night which was catered by Barts Ice Cream (which was absolutely fantastic!). Here are the photos from today! More coverage coming tomorrow. Welcome to NUTC Gold! It has been a great 48 hours here with the second batch of campers and our second year of NUTC Gold. So far we have had a disc golf tourney, a lecture by the brilliant Dr. Goldberg, teams have been formed and scrimmages have took place. Yesterday morning I took footage of each camper throwing and met with the campers last night and after lunch today to go over their strengths and weaknesses. I have lots of photos from the last two days to share with all of you. The campers are having a blast and are looking forward to the Camper vs. Counselor game tonight. While the campers are making their way back home, I have been sitting here in the office uploading the rest of the photos from yesterday along with the over 400 photos I took today! Session A went very smoothly and was the exact way that I wanted to start the NUTC season. The campers were amazing and highly talented. The Talent Show last night was one of the greatest that I've seen in a long time. Stealing the show was the Blue team with their piece of Avatar in 10 minutes. Not only did they steal the show but won the NUTC tournament championship as well. Congrats Blue Team (lead by coaches Darden Pitts and Ben Mew)! Without further ado what you are really wanting to see the media. NUTC Gold starts Saturday... I can't wait! I'm am here at tournament central sitting under the tent as the teams are warming up for round two of the NUTC tournament. The Red team is about to take on the Purple team while the Orange team is going to try and capture the win over Green. The Blue team was able to win a second round bye this morning (via Ro Sham Bo) allowing them to sleep in an hour later than the other teams and slowly warm up. Here are yesterday's photos and today's newsletter. Both teams are about to pull so it's time to get out there to take more footage. I have a lot of photos to share with you today along with a couple newsletters. Last night was the weekly camper vs. counselor game which once again the counselors prevailed over the campers 21-3. It was a fun match up and the campers learned a lot by playing and watching the counselors demonstrate at game speed the skills and drills we have been teaching them thus far. The game has pumped them up even further for their training session this morning. 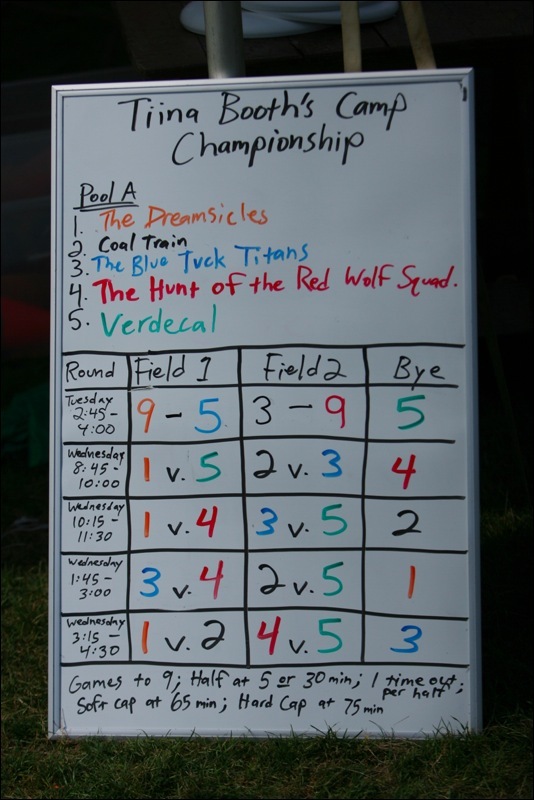 This afternoon the Disc Olympics will take place along with round one of the NUTC Session A Tournament. Back to the fields for me, until later, enjoy! Welcome to NUTC 2011! Session A! 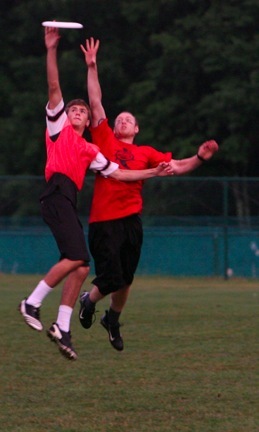 Welcome to the 2011 season of NUTC. Staff arrived to set up camp last friday, the first group of great campers arrived yesterday and today we have been playing a lot of ultimate and having loads of fun! This morning started off with campers learning and redefining their resets to become more effective and efficient offensive machines. This afternoon there were three rounds of scrimmages where the players were able to apply the skills that worked on in the morning directly to their game. After recreation hour and dinner the evening event tonight was the Session A Team Night where the campers found out what teams they will be playing with for the rest of the week. Everyone was very excited and thrilled about the antics that took place to determine which team was able to select which color. This evening for you I have a few photos from yesterday, a batch of photos from this morning and this afternoon/evening along with the daily newsletters (from Saturday and Sunday) the campers receive each day. It's only going to get more action-packed and electrifying from here on out.